Meet: outside Central Library, time tbc. Book a private tour! We have taken a huge number of private groups around the hotel (with the option of cream tea in the restaurant at the end). To find out more, please e-mail info@newmanchesterwalks.com. Here’s the story: The Radisson is one of only two 5-Star hotels in Manchester. It was created in 2000 around the shell of the Free Trade Hall, the city’s most famous building, where Disraeli discoursed, Dickens declaimed and Dylan was derided. As a hotel, it is now where the most glamorous visitors to the city – Bill Clinton, Kylie Minogue, Sven and Gordon Brown (!) – have been pampered in the penthouses and bathed in the warm pools downstairs. 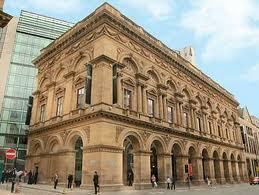 Some of the much-loved, much-mourned Free Trade Hall survives. The statues of the figures that performed here that used to line the back wall are now in the stair well. The autograph wall signed by Anna Neagle, Segovia, Bobby Robson and Louis Armstrong and many others, is on display upstairs. 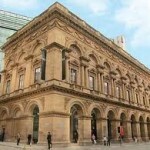 Edward Walters’s grand Renaissance-styled architecture, with the shields of the towns that supported Manchester in its bid for free trade decorated in stone between the arches, still forms the façade. Rooms and suites are named after famous figures such as Ella Fitzgerald, David Bowie and Rudolph Valentino who performed here. The Peterloo painting reminds visitors of the tragedy played out on this site in 1819. The Halle rooms recall the thousands of concerts orchestrated within; of the swirling batons swished by Hans Richter and John Barbirolli. This is luxury; a ledger of living and lasting legends. As a tour, it’s a taste of everything that Manchester stands for: quality, taste, fierce independence, a rebellious spirit, carefully-crafted culture and formidable architecture. We end with the best elevated views of Manchester and beyond via a special key that takes us where only the heaviest-walleted guests normally step. Finally we enter one of the beautifully decorated rooms, though you will be caught if you try to hide under the bed. In October we were fortunate enough to gain access to the “Dylan” penthouse. We could stand next to and even touch the very bed where Gordon Brown once kipped. Phew! * We can do this as a private tour, ending with a sumptuous tea laden with those wonderfully dinky triangular sandwiches. Yes, how do they make them, given that you never see a triangular loaf? Please contact us (info@newmanchesterwalks.com, 07769 29 8068) for details.